Share your Parkdale love and vote for the Best of 2014! 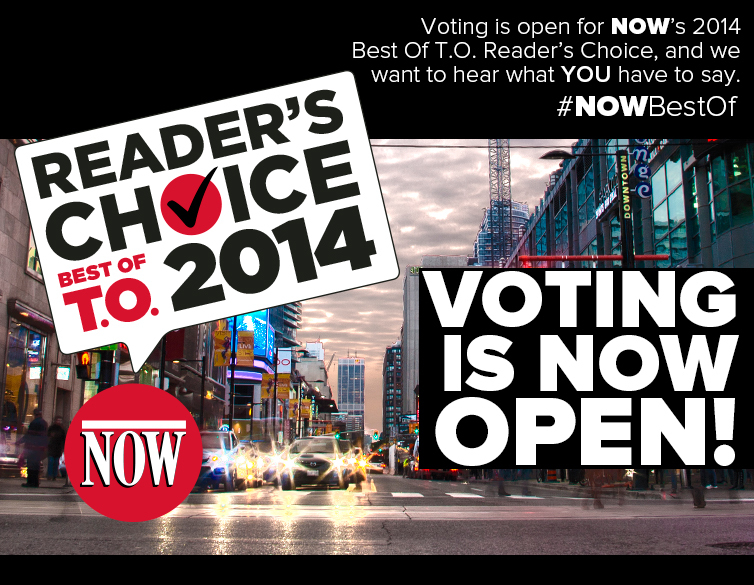 It’s that time of year again, time to have your say in picking the top shopping spots, bars and restaurants throughout the City with NOW Magazine’s Best Of Toronto Reader’s Choice. Parkdale is full of great spots to shop, grab a bite or have drinks with friends and this year’s list of nominees prove that well. Take a few minutes to vote for your favourites and let the rest of Toronto know that Parkdale is the place to be! This entry was posted in Uncategorized and tagged Bacchus Roti, Best of, Cadillac Lounge, Chantecler, Common Sort, Coriander Girl, Easy Restaurant, Food, Glory Hole Doughnuts, Grand Electric, Local, Local Kitchen and Wine Bar, Made You Look, Mother India, North Standard Trading Post, NOW Magazine, Parkdale, Queen West antique Centre, Shopping, Small Town Food Co, The Rhino, The Yukon, Wrongbar, Yummy Stuff, Zeze Food and Drink by Parkdale Village BIA. Bookmark the permalink.